The Tribe Provisions Adventure Hammock was a bit of a surprise—high-quality diamond ripstop fabric with generous dimensions at an amazing price point. 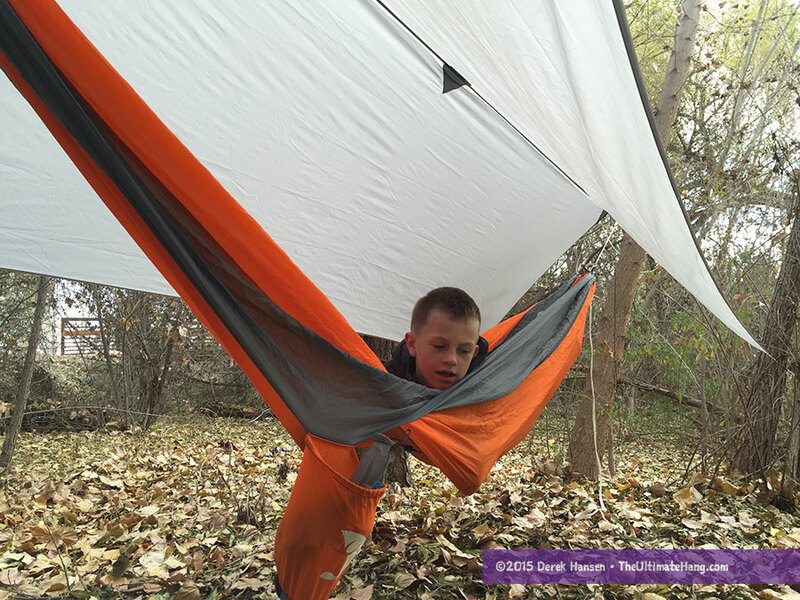 The Adventure Hammock is similar in build to all the basic parachute nylon hammocks on the market, with a few key differences. The overall construction includes the typical three panels of fabric (not my favorite), but the material is a soft yet strong diamond ripstop. 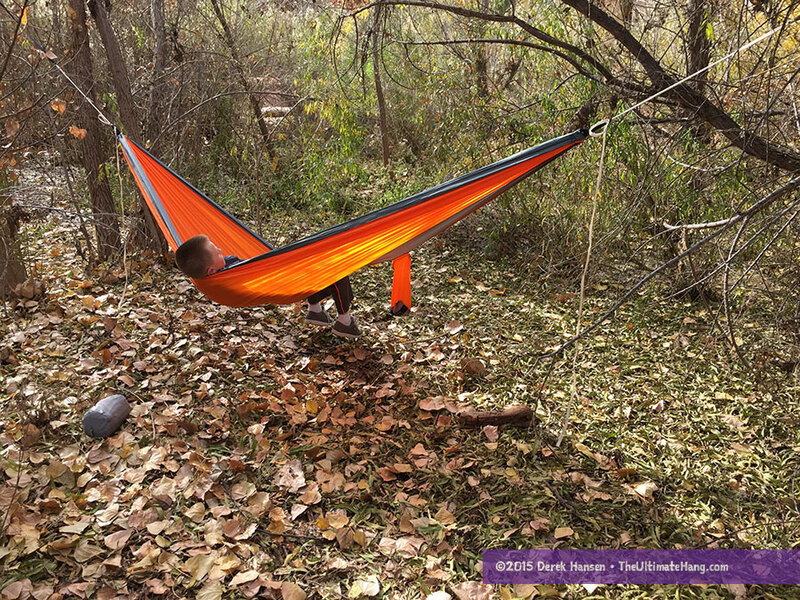 The first hammock to have this fabric style was the Kammok Roo, and it is now being replicated among other manufacturers. It has a nice hand, is very strong, and fairly comfortable. The stuff sack on the Adventure is sewn off center on the hammock, and it features a nice carry handle. 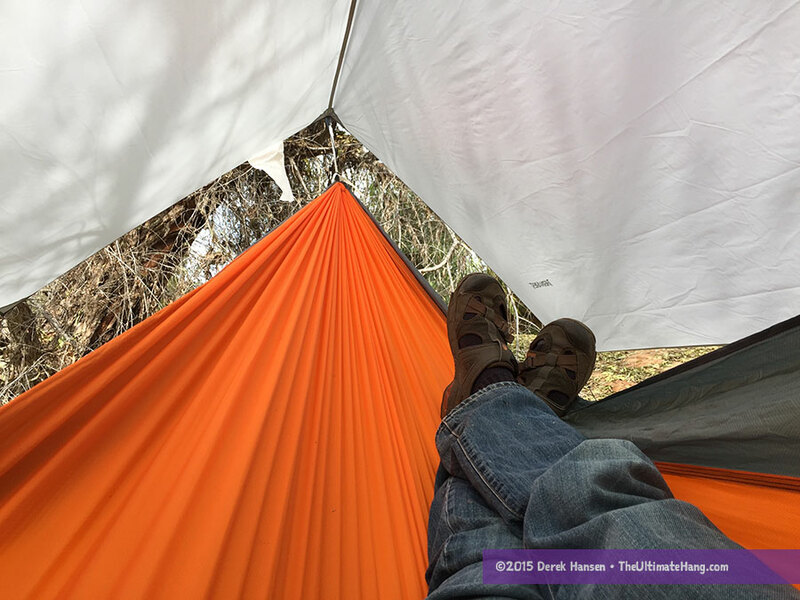 What really impresses me about this hammock is the price point for the high-quality material. The dimensions are just right too: mine measures just over 10 ft (3 m) long and 5 ft (152 cm) wide. I’m always cautious about claiming subjective comfort, but these dimensions should work with most hangers around 6 ft (1.8 m) tall. The steel spring-gate carabiners are common for hammocks with a value price point, but that doesn’t make me like them any better. They snag easily on the rope they clip to and can be sometimes difficult to work with. Plus, they’re heavy, so I replace them quickly. The end ropes are serviceable but could be replaced with your favorite suspension system. Be sure to pick up a pair of webbing straps (not included) to hang the hammock. I like the stuff sack being located off-center because it is less likely to drag on the ground. It is still easy to access to hold odds-and-ends like a water bottle, flashlight, etc. The design of the sack is helpful: the rounded bottom helps keep the bag open when packing/storing, and the carry handle makes it easy to carry, store, and unpack. The little details make all the difference. Overall, I really like this hammock, especially for the great fabric, quality build, and low price point. This is probably the best deal I’ve found for a manufactured hammock. Dude! They are currently $24 and some change on Amazon!! !